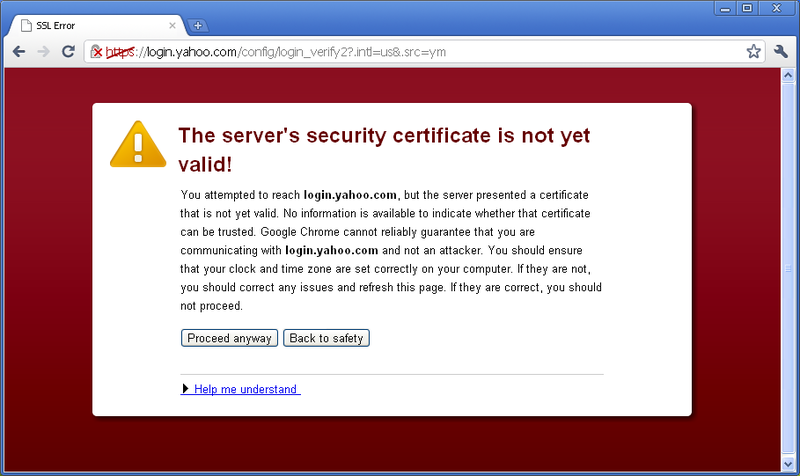 Now and then you might have encountered the problem Server “Security Certificate is not yet valid” when you open your browser like Google Chrome or Mozilla Firefox. The screen looks something in the image here. This problem even happens when you have installed the fresh copy of the browser. This problem occurs due to the wrong time and date setting of your computer. You can solve this problem by following the simple steps below. 1. Check the date and time on your system if its correct or not. If your system resets to some old date time and time every time you restart the system then you need to change the battery on the motherboard which is responsible for the clock to run. Go to the Control Panel of your computer. Adjust correct date and time according to your region. Open “Internet Time Zone” tab. Click on “Update Now” button. After clicking on the button, It will start synchronizing your internet server timing. After 7-8 seconds you will see a message, “The time has been successfully synchronized with time.windows.com on 07-07-2013 at 5:09 PM.